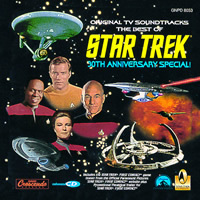 GNP Cresendo presents THE BEST OF STAR TREK: 30TH ANNIVERSARY SPECIAL - a collection of music from STAR TREK The original series on through STAR TREK VOYAGER. Featuring music by Alexander Courage, Jerry Goldsmith. Jerry Fielding, Dennis McCarthy, Jay Chattaway and more.